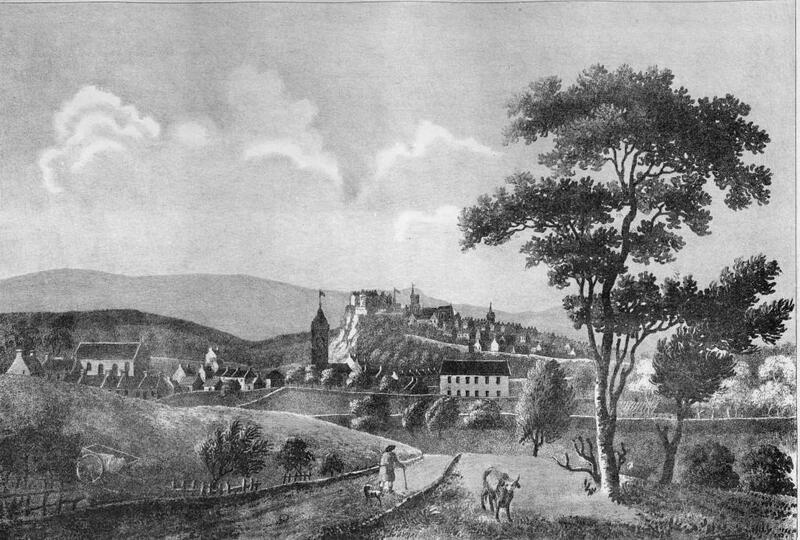 This view dates from the mid 1740s, and is certainly before 1 February 1746, when the retreating Jacobite army accidentally blew up St.Ninian’s Church, leaving only the tower which stands today. Weaver’s Row to the left of the church also still remains. The view is taken from the old Glasgow road from the south. Little is known about the artist J. Harvie, but he dedicated the production of the print to James Graham, Duke of Montrose and included the arms of the Graham family beneath. The Grahams were major landowners in the area. The large building to the right of the Church is Easter Livilands House which survived at Shirra’s Brae until 1970, when it was so badly vandalised that demolition was the only option. The Easter Livilands estate was sold to the developer Mowlem Ltd. in 1962, and the present Pelstream Avenue and Melfort Drive houses were built there.